The Two Waters Wander at Leighton Buzzard Walking RouteThis walk starts in the centre of Leighton Buzzard and takes you along the Grand Union Canal and the banks of the River Ouzel and back to where you started. The river and its surroundings are rich habitats for wildlife including kingfishers and herons. Start/Finish Point: Start at the Energie gym in Leighton Road. Start Nat GR SP916251. 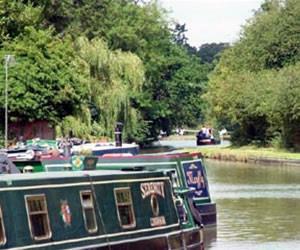 This walk starts in the centre of Leighton Buzzard and takes you along the Grand Union Canal and the banks of the River Ouzel and back to where you started. The river and its surroundings are rich habitats for wildlife including kingfishers and herons. How to get there by car/Parking: Leighton Buzzard lies to the north of the A505, about 8 miles to the west of Dunstable. There is parking off of Leighton Road or at the train station.